The NETLab Toolkit can take input from the Microsoft Kinect system, making it very easy to track a person’s position and gestures. For example, it’s possible to use the left hand’s position to control the volume of a sound as the person moves their hand up and down. Special thanks go to Nathan Cornes in Brazil for helping to figure out how to do this, creating the OSCulator patch, and making suggestions for improvements to the toolkit! 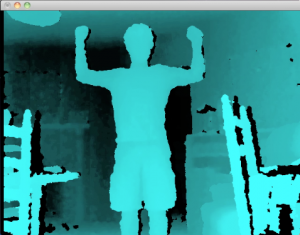 Kinect Sensor – with an external power supply (third party versions can be found much cheaper on Amazon and eBay). You DO NOT need an XBox. an alternative with NI-Mate is to use /Head, /Body, /Hand_Left, or /Hand_Left – other options are available, see the OSC tab in NI-Mate. Using these settings gives you data even if the Kinect doesn’t find a skeleton – so if you only need the person’s position, then use one of these, since the Kinect will acquire this data more easily and quickly. There are two ways you can access the joint coordinates. 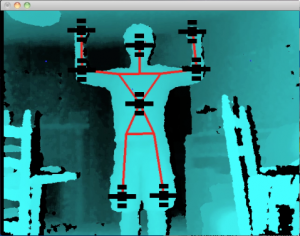 The kinect_skeleton_demo.fla file shows both of these methods. Use controllerInputNum to get a single value – In this method, you choose a number that corresponds to the single joint and x,y or z value of that joint. That single joint value is then available to use in the normal way by any widget that is set to listen to the input widget. 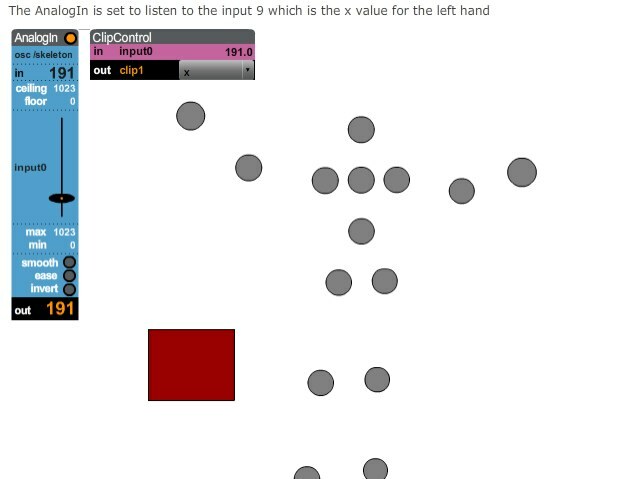 For example, if you wanted to use the X position of the person’s left hand, you would input 9 for Synapse, 15 for NI-Mate into the controllerInputNum parameter of the widget. Use code to access all 45 values for all the joints – If you need access to many of the joint values, it is better to use code to get at an array of values that can then be used in any way you choose. In the demo, the code creates 15 circles, and then sets their x,y position and size based on the x,y,z values respectively for each joint.